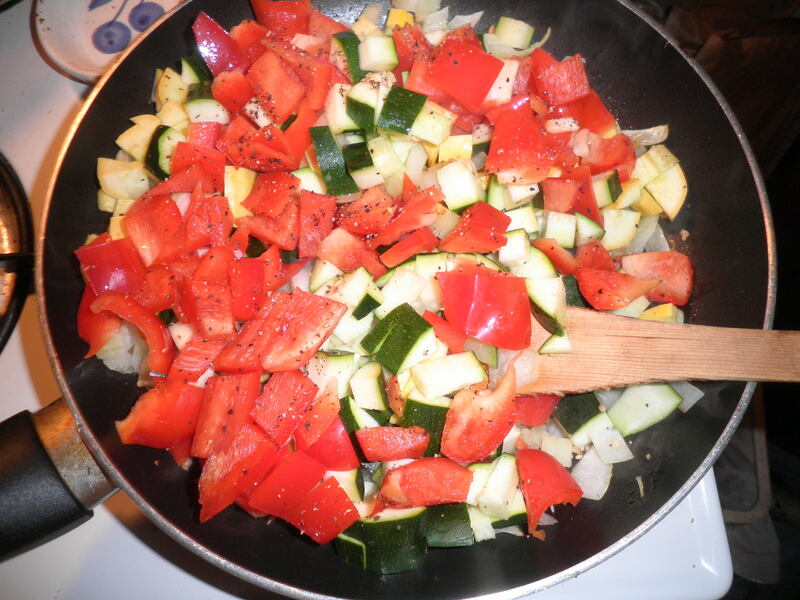 I was complaining yesterday about the lack of veggies (and fruit) I consumed on my two recent trips. I worked on correcting that today. I headed off to our local produce market to do some stocking up. 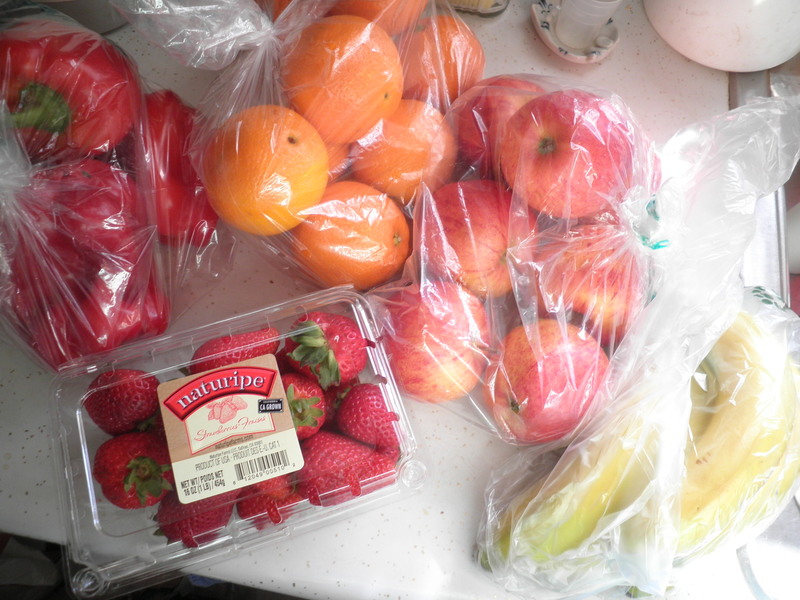 Red bell peppers, Gala apples, bananas and strawberries. I also got onions (which for some reason I always forget to buy), plum tomatoes and more Romaine lettuce. I still have some Romaine from before the Atlanta trip but it needs serious pruning to be useful. Didn’t want to be without so I had to get more! Made a stop at Shoprite and picked up these. I keep hearing so much about the apple cider vinegar cocktail. I never thought that Shoprite would have the Bragg’s but they did. 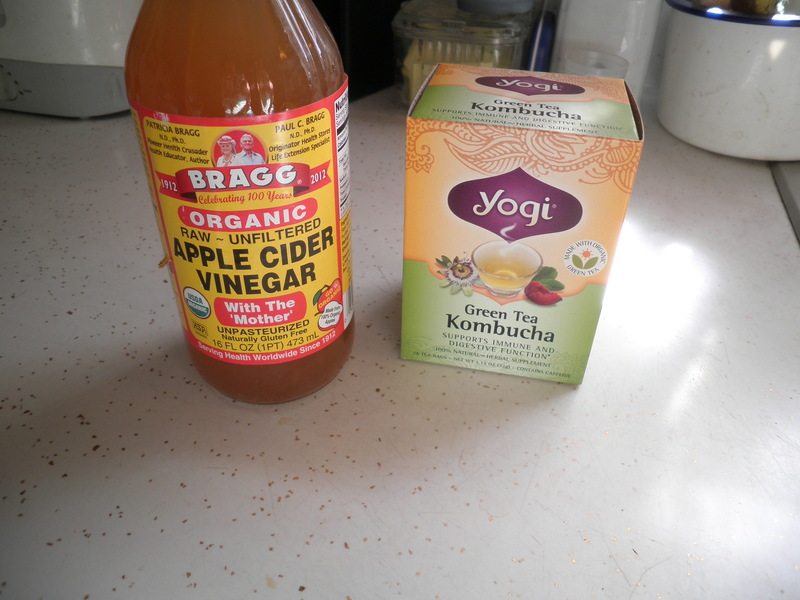 Since I can’t find Kombucha bottled, I decided I should give it a try in tea bag form. 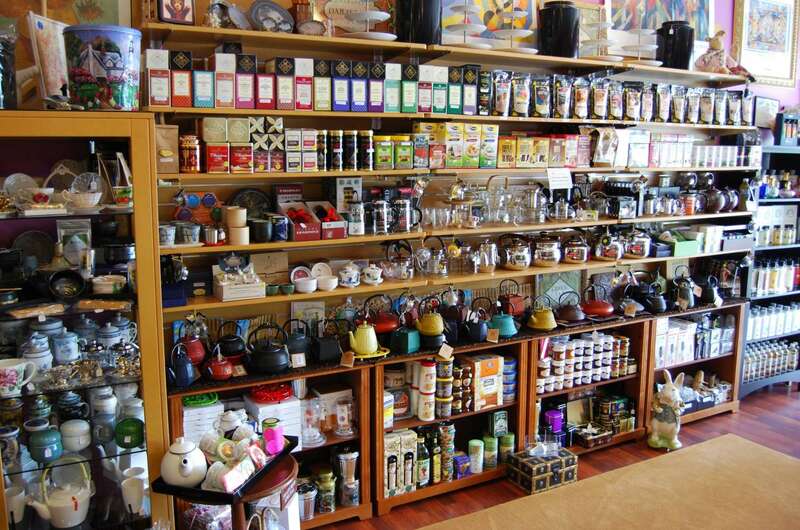 My plan is to make the tea tonight and it will be cold for morning consumption. Should be interesting to see what happens. I’ll keep you posted on this. 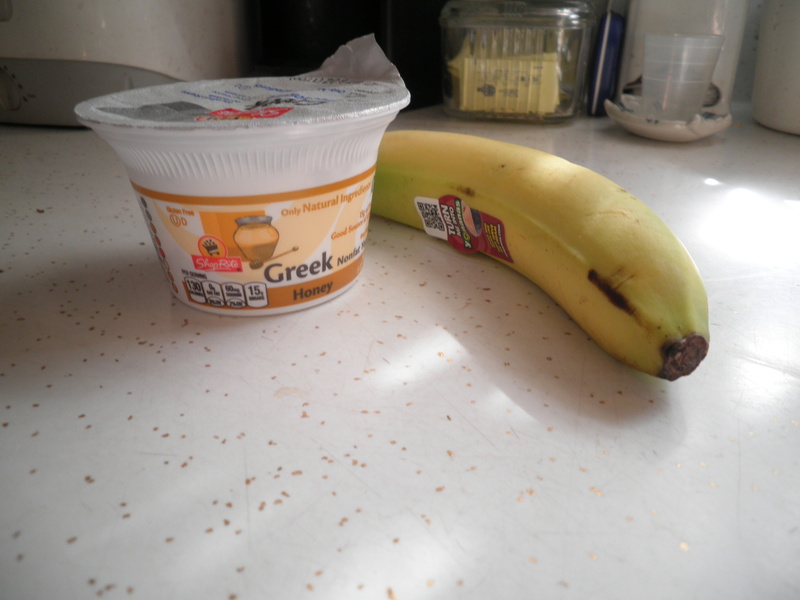 After my shopping trip, I had a banana and Shoprite brand Greek yogurt with honey. This brand is so good and was on sale for 88 cents, much cheaper than Chobani and very tasty. 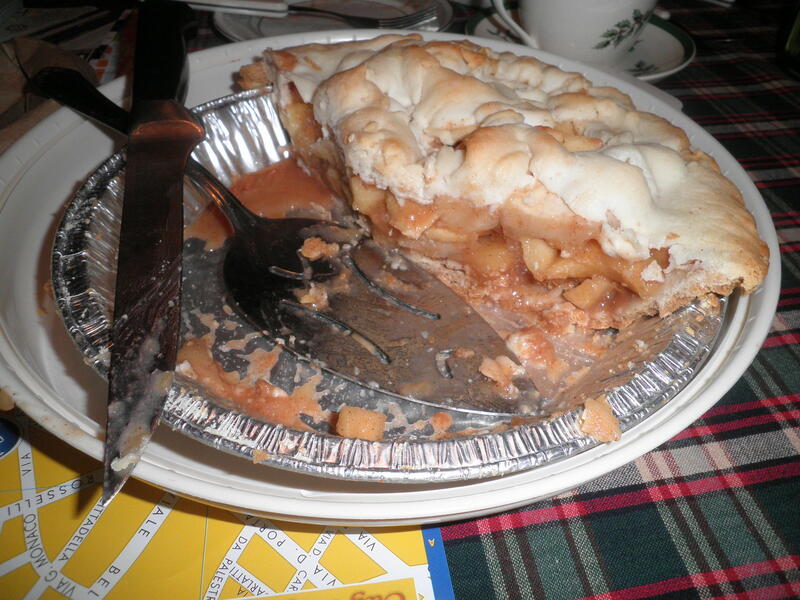 It was as filling as I had hoped. Lunchtime came and I was glad I had finally remembered to get cottage cheese. It really is a protein bonus-15 grams for a half cup and only 2 Points on Weight Watchers. I removed some of the sad and droopy leaves from one of the leftover heads of Romaine to get to the good part. 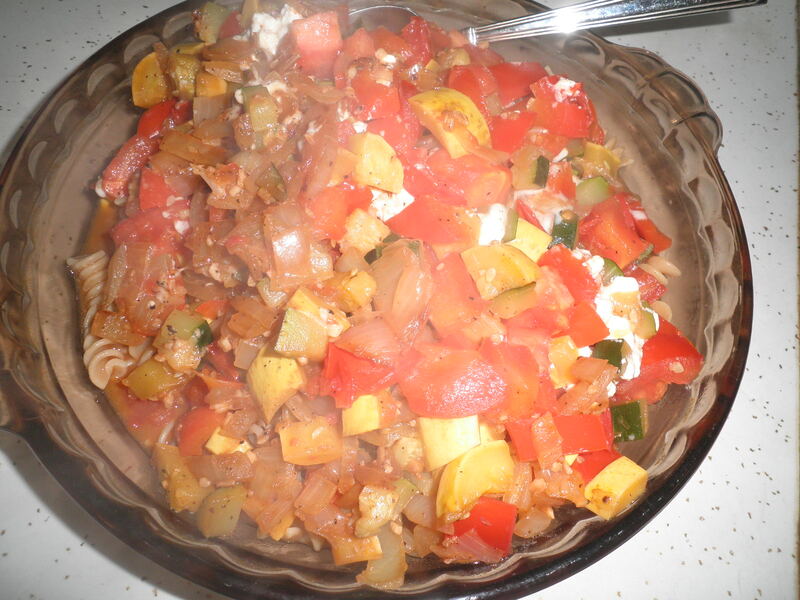 Chopped that up with too older plum tomatoes. 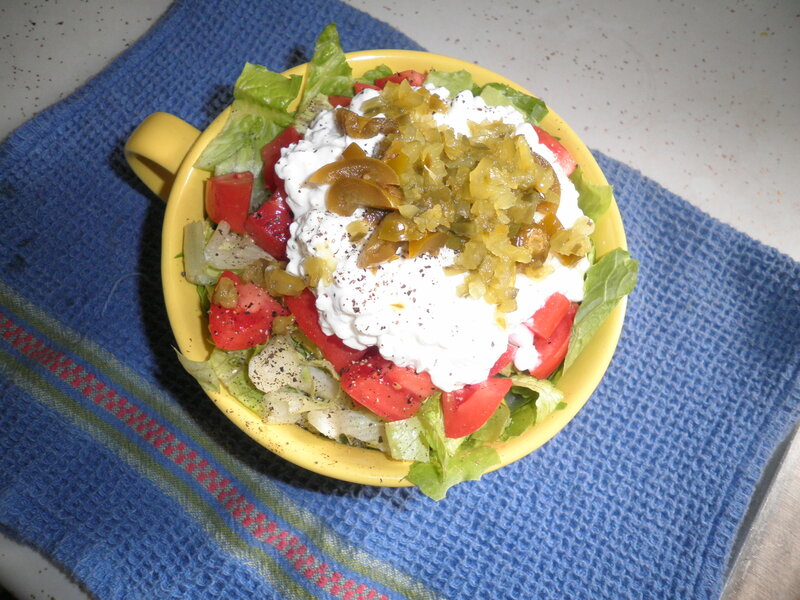 Topped with the half cup of cottage cheese, chopped jarred jalapeno and sweet pickle relish. Of course I also added (as always!) enormous amounts of ground black pepper! This is one of my old favorites and very filling, too. I’m feeling more back on track now and I’m hoping for a respectable result on Saturday at Weight Watchers. I’ve felt so off track since we got back, but I’m doing my best to focus on the tasks at hand-both regarding food and projects. There’s just so much to do…I need to Inspire Myself! 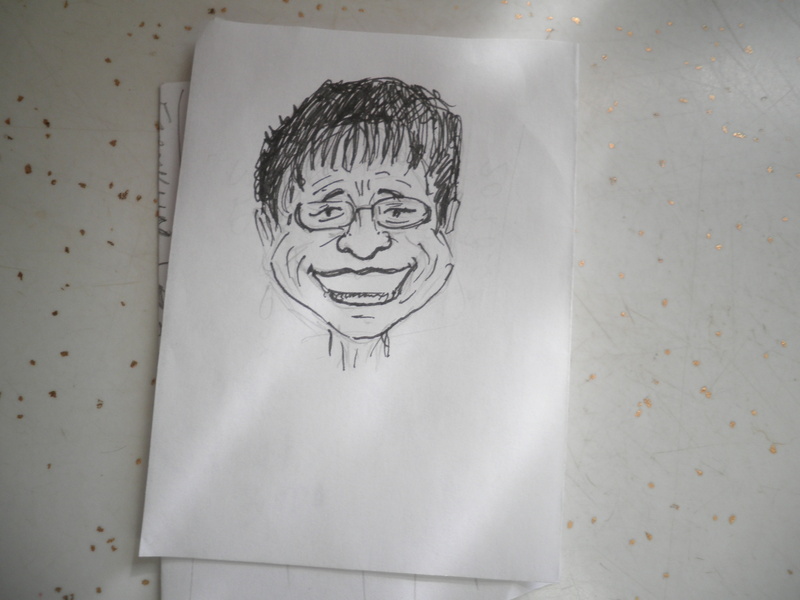 Ralph confirms that it’s me…I know my hair is short but it’s not That Short!! Guess I need to grow it in a bit to not see this again! It seems like we have a lot of birthday celebrations in our family. That’s a good thing, actually! It’s great to get together with family with a reason to celebrate. Although I’ve titled this Another Happy Birthday, I came close to using the title of Crappy Birthday. I have really not been feeling well the last few days. Nothing I can put my finger on. It feels like there a war zone in my abdomen! Loud noises and things moving around. Very spooky…I was afraid I was in a new sequel to Aliens! I had to make the effort to go to our planned lunch but boy I didn’t feel like it. 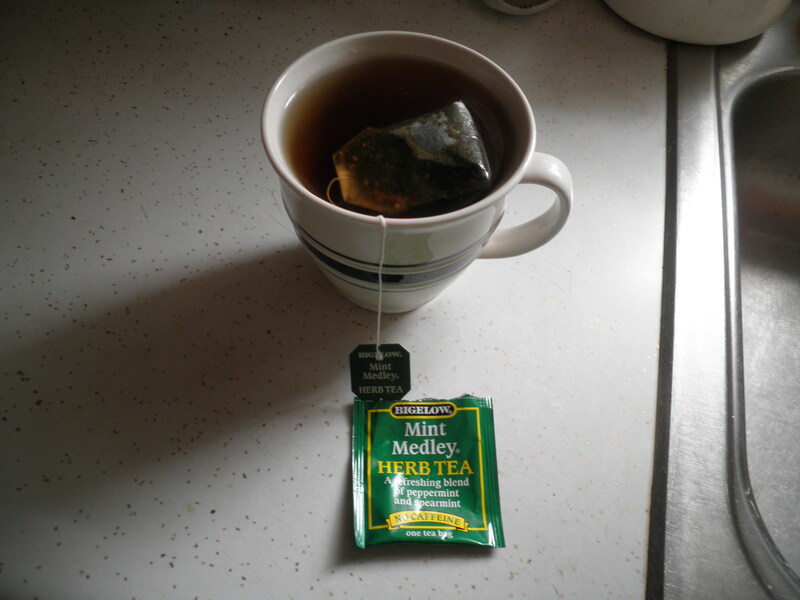 A big cup of mint tea usually helps when I’m having this kind of discomfort. It actually reminded me of the upset stomach I used to get when I was still working and people were driving me crazy. The tea did a lot to make me feel better. We were set to meet everyone at 1pm. I didn’t take a lot of photos because I wasn’t really on my game. I wasn’t sure what I’d choose to eat either. 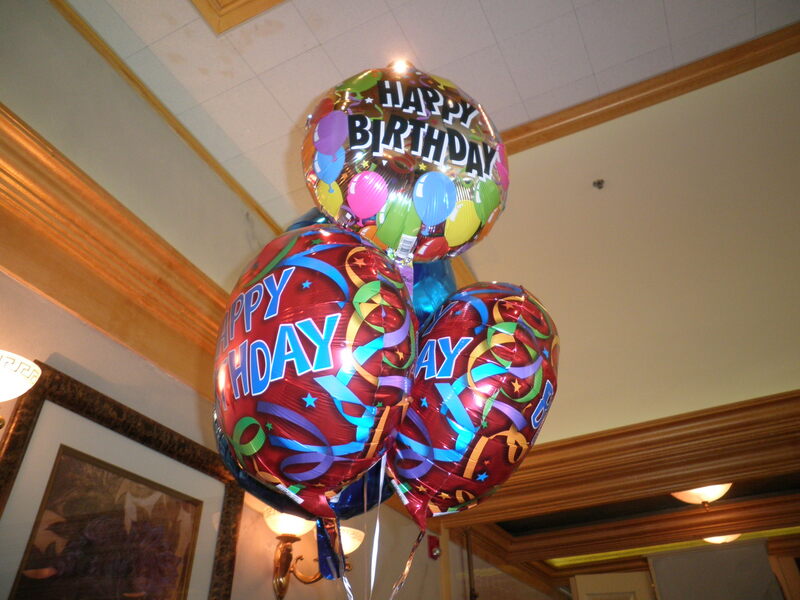 You’ve got to have balloons for a party! 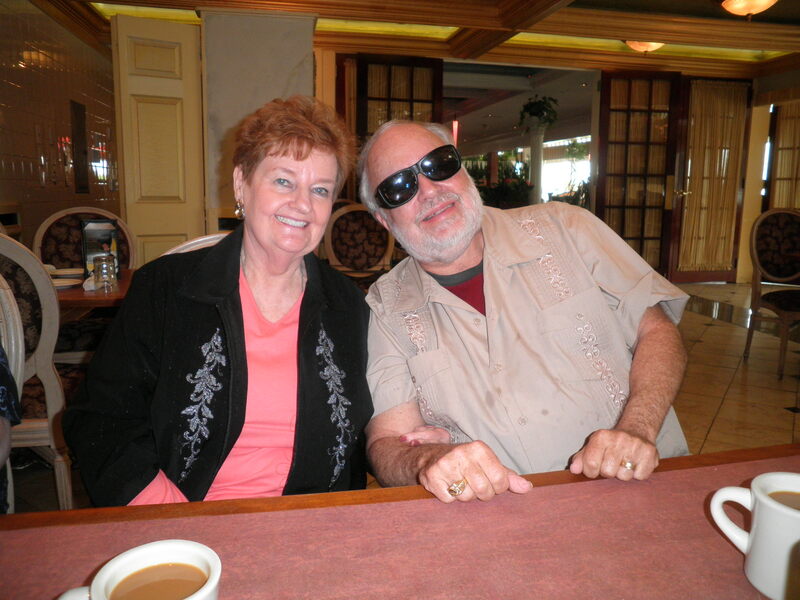 My wonderful Sister-In-Law Maddie and her husband, George…the man of mystery behind his Foster-Grants! It was George’s birthday we were here to celebrate. My lunch was what was called a specialty vegetarian panini. 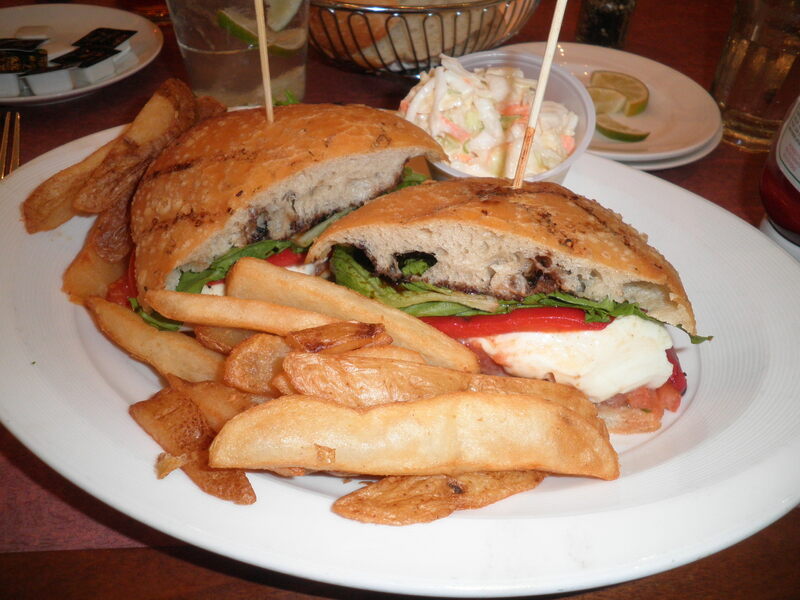 Mozzarella cheese, Portobello mushroom, roasted red peppers, tomatoes and balsamic vinaigrette. 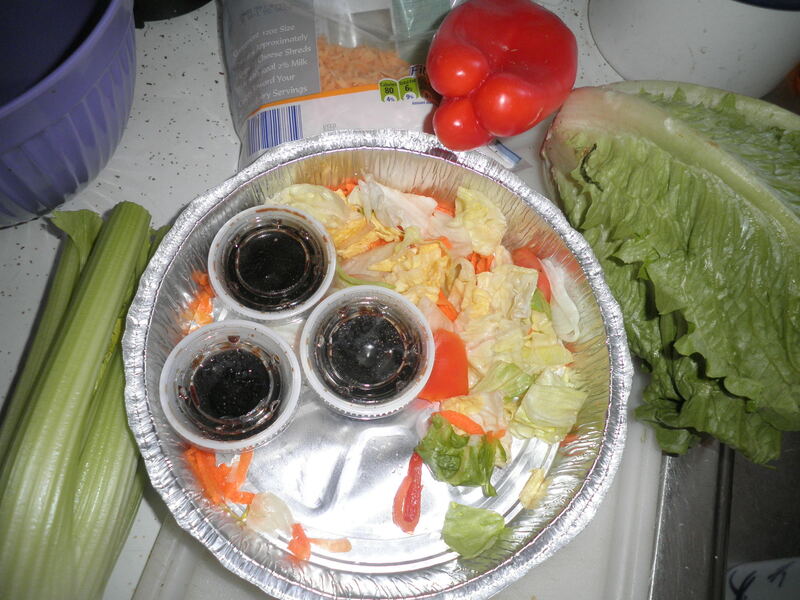 There was a little too much of the vinaigrette, it made the sandwich a little soggy. It would probably have been tasty if I had felt better. I ate about a third of the fries. Not because I wanted them, but because they were there. A good reason to ask for them left off the plate, but again, I wasn’t really thinking that way. Seltzer with lime in the background in hopes of settling my raging tummy! 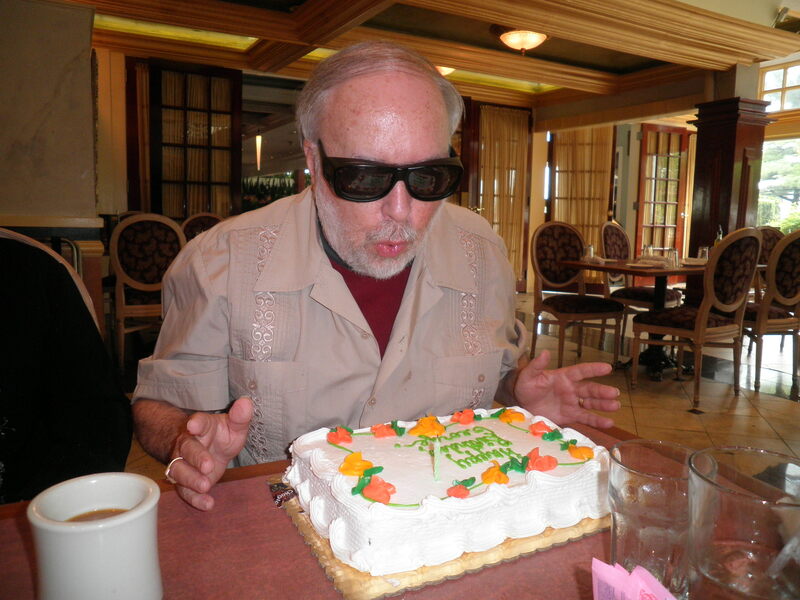 The Birthday Boy blowing out the candle on his cake. I don’t know why I think this photo is so cute, I just do! George is such a sweetheart! 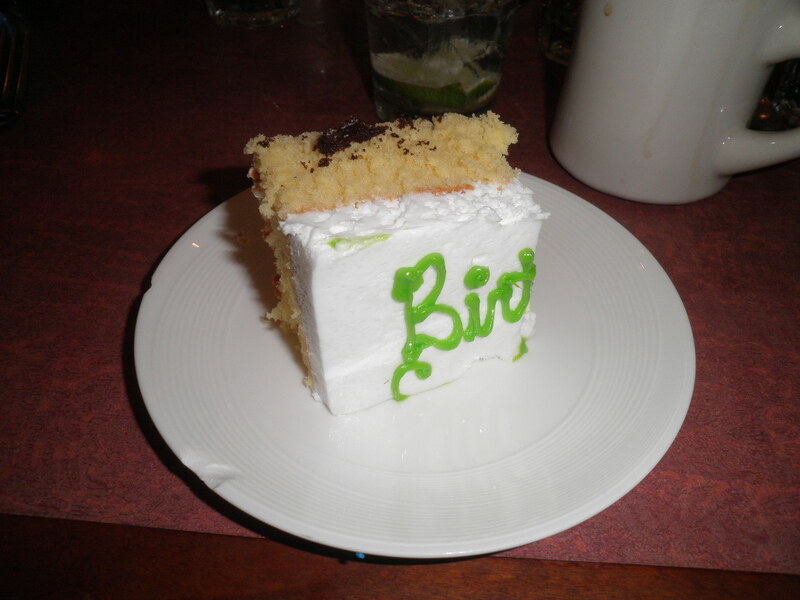 My little piece of cake that looks much larger in this photo than it actually was! Now this actually tasted good! We had a great time together, I just wish I’d been feeling better. However as we said our goodbyes and were walking to our cars we noticed a beautiful sight. 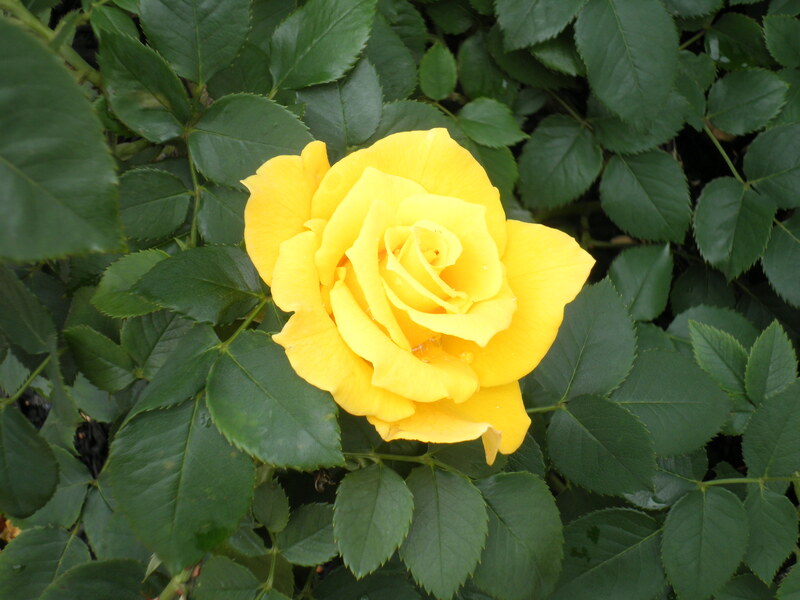 The rose bushes along the side of the building were all in various stages of bloom. So pretty! It’s been a beautiful spring with all of the flowering trees and I haven’t gotten any good photos. I’m glad I caught these beauties to share with you. We’ve got an annual doctor’s appointment for Ralph this afternoon. Before and after that, I’m just going to be resting and trying to feel better. I’d almost rather be Really sick than Semi sick. Good excuse to finish The Shadow of the Wind. It is so good. I know I’m going to be sorry when I’m finished. Love it when a book is that good that I miss it when it’s over. I’m hoping for a good result when I get on the scale at Weight Watchers today. I’ve been working hard all week and I’ve even been able to control my night-time snacking to a large degree so I’m hopeful! Of course you can never tell so stay tuned. Friday I got back to an old favorite for breakfast. 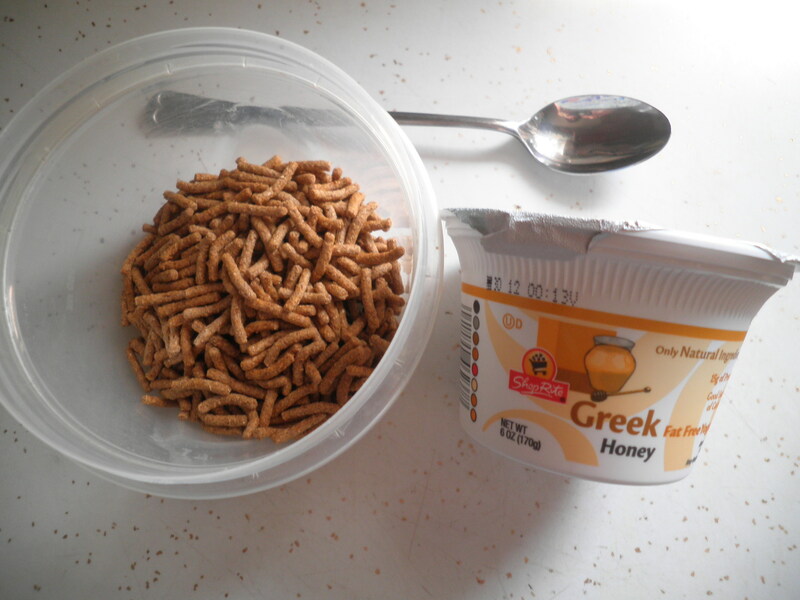 I love the combo of yogurt with Fiber One. It’s sweet and creamy and crunchy and over all good for me. This is actually the Aldi version of Fiber One. It’s over $2 less that the brand name and tastes the same. I’ve almost finished the Shoprite brand of Greek yogurt. I’m going to stop there to restock today. So much less expensive than Chobani. I actually got some cleaning done around here on Friday, some cabinets re-ordered to make life simpler…that sort of thing. It feels good to accomplish things like that. Had time to finish the book I was reading. Animal Dreams by Barbara Kingsolver. I really enjoyed it. 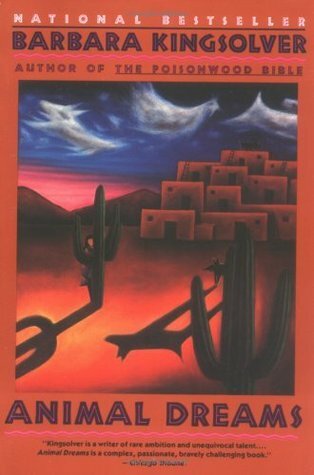 I think I especially liked it because it was set in the Southwest and even though the town in it is fictitious and in Arizona, it made me think of New Mexico. Late afternoon brought a cup of tea, I love pairing green tea with another tea. This lemon ginger from Bigelow is very good. And a new book. 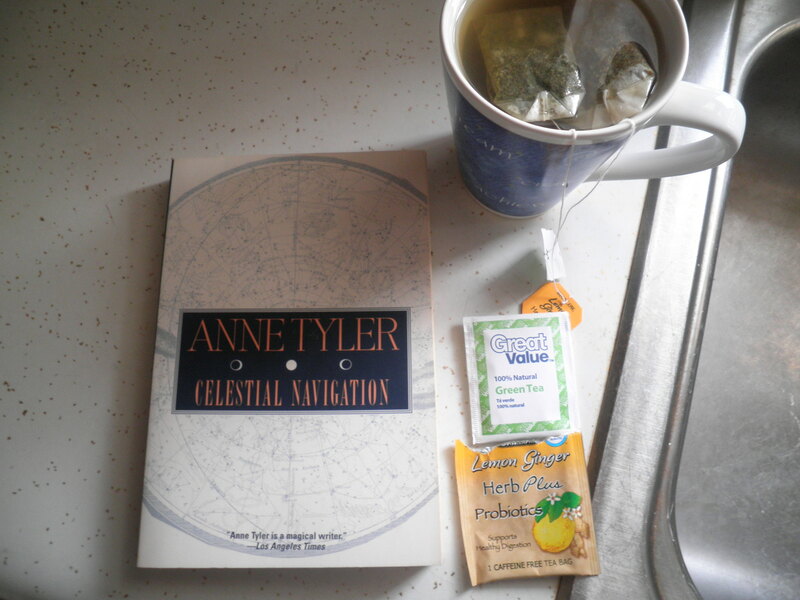 Celestial Navigation by Anne Tyler. I’ve read a lot of her books. Interesting so far. Dinner was approached with an eye toward weigh in. So delicious! Kept me satisfied for the night. I’m off to Weight Watchers in about an hour. I’m looking for some good news and I’ve got more projects in mind for this afternoon, so it should be a busy day. What a fun thing to have a great celebration in the middle of the week. 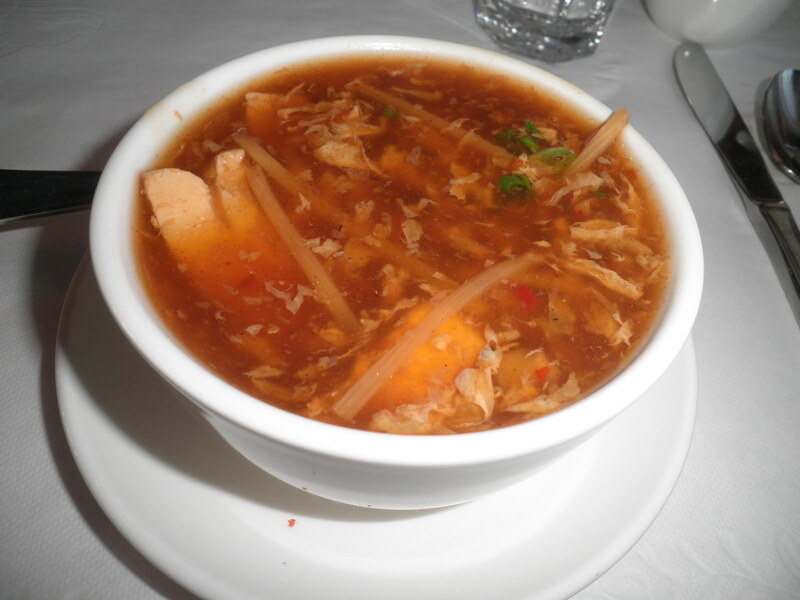 It’s What I Ate Wednesday! If you’ve read BCDC for any length of time, you know that WIAW is the fun and games cooked up by Jenn over at Peas & Crayons! 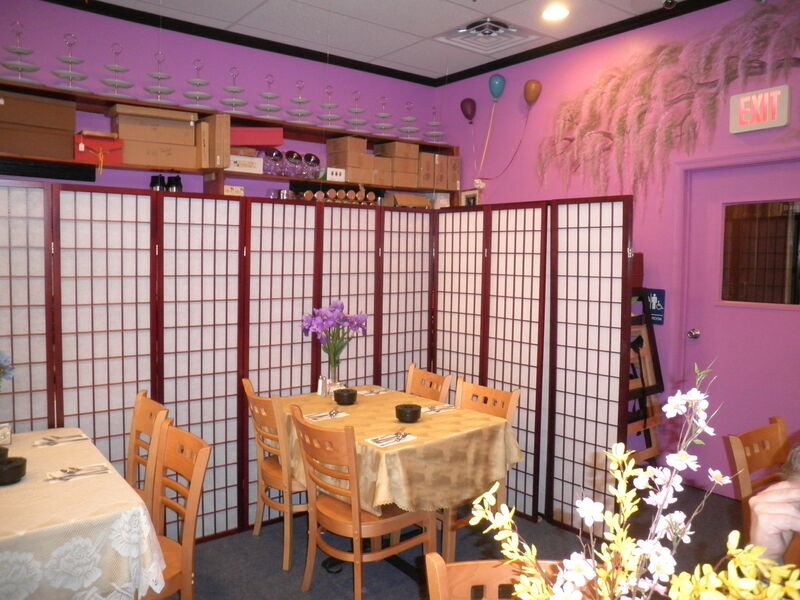 After you’ve had your fill here, please be sure to travel over to P&C to see some great food and stories and leave some comments! The theme is Green, which for me is not tough considering I have been a vegetarian for 22 years or more. I don’t actually remember when I decided to be vegetarian. I know it was after I joined Weight Watchers which at the end of March will be 25 years! I’m figuring it’s about 22 years. That sounds fair. So obviously for that reason…Green is OK with me! I’ve been drinking more green tea lately. 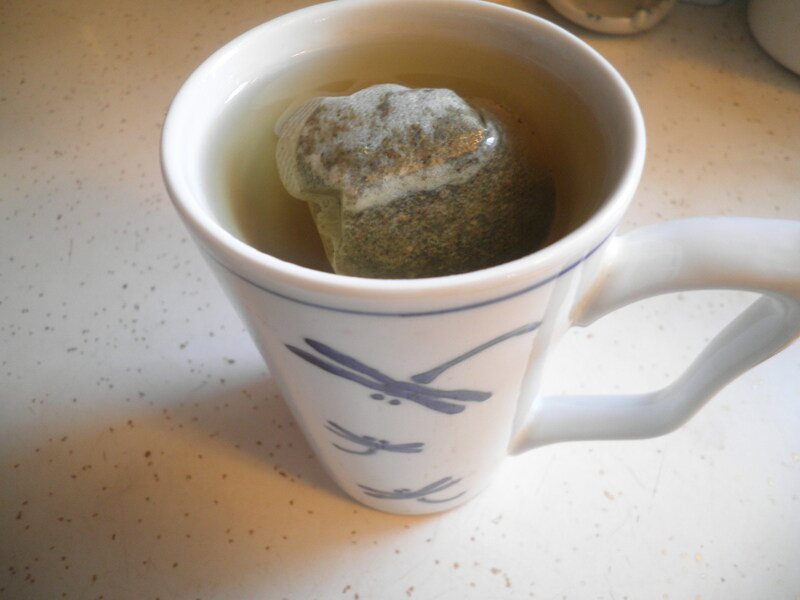 I know it’s good for me and since in recent months Ralph and I have a cup of tea most afternoons, I’ve been going Green. 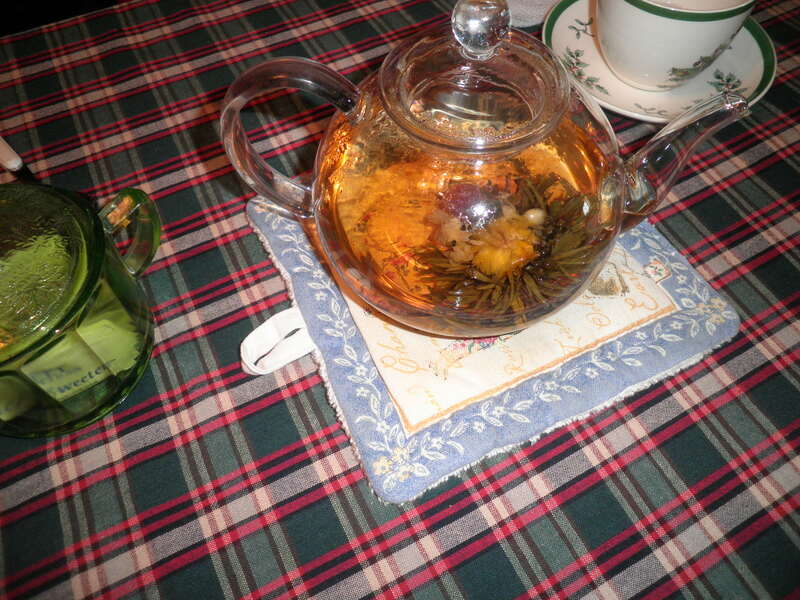 I like to mix it with other flavored teas, in the case Stash’s Lemon Ginger. Really Good! 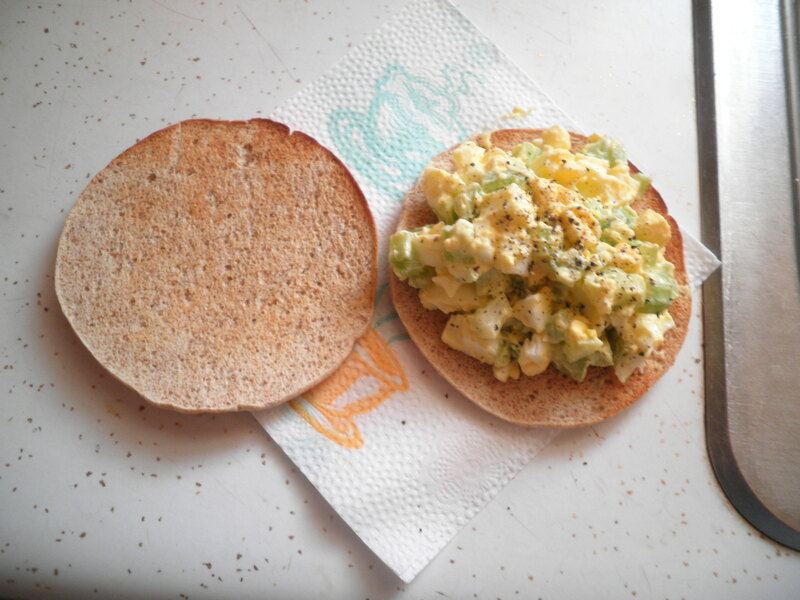 Egg salad on a toasted sandwich thin with celery going for the Green! I’m using more and more celery lately. I love the crunch it adds to things. 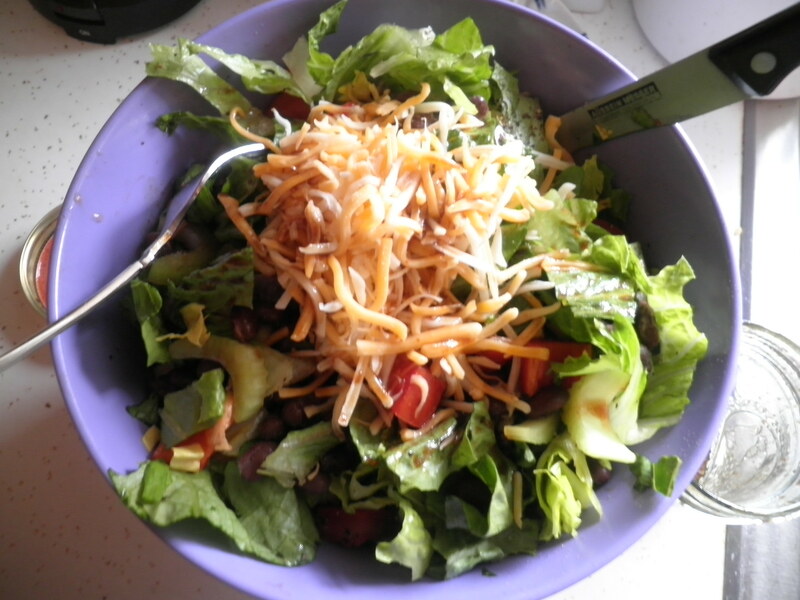 Never being one to waste things, I decided to make the most of the leftover salad from our Saturday night pizza and salad dinner. Celery (my new best friend!) 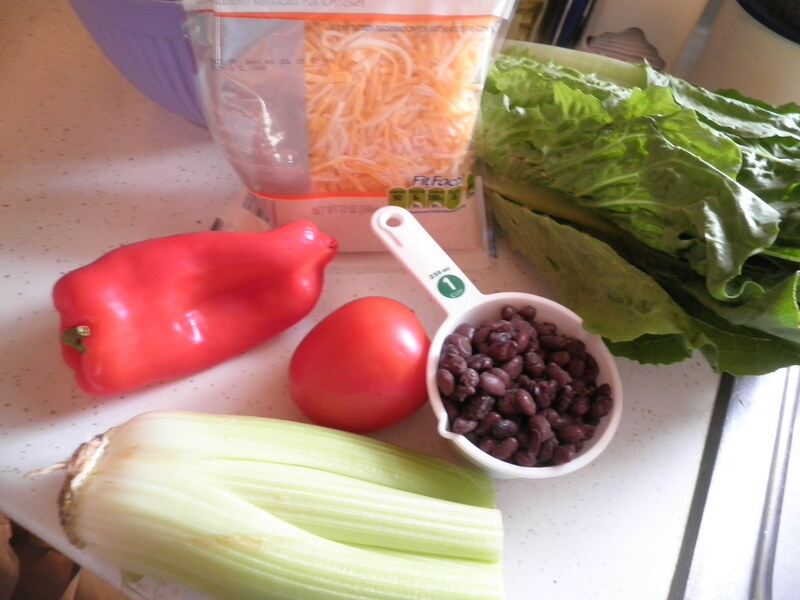 red bell pepper, Romaine, and shredded cheese. 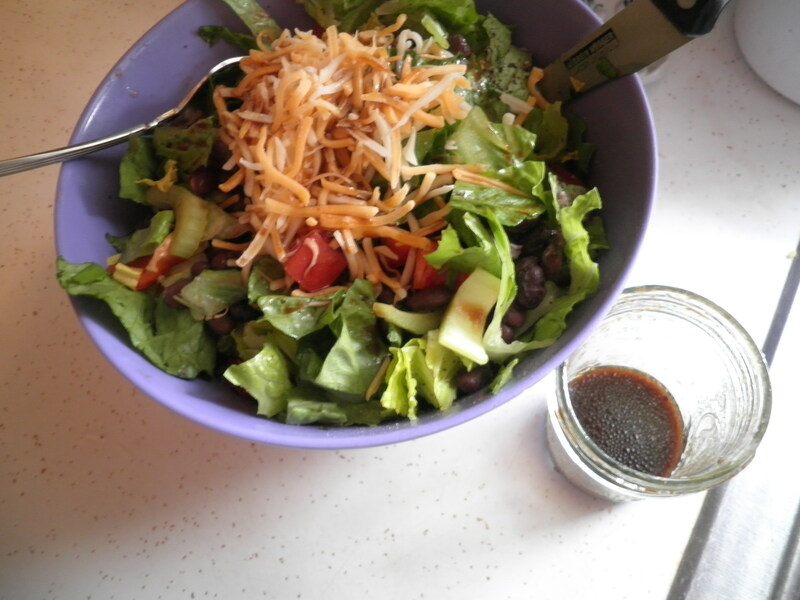 All mixed up in my Big Purple Bowl…I love these salads! 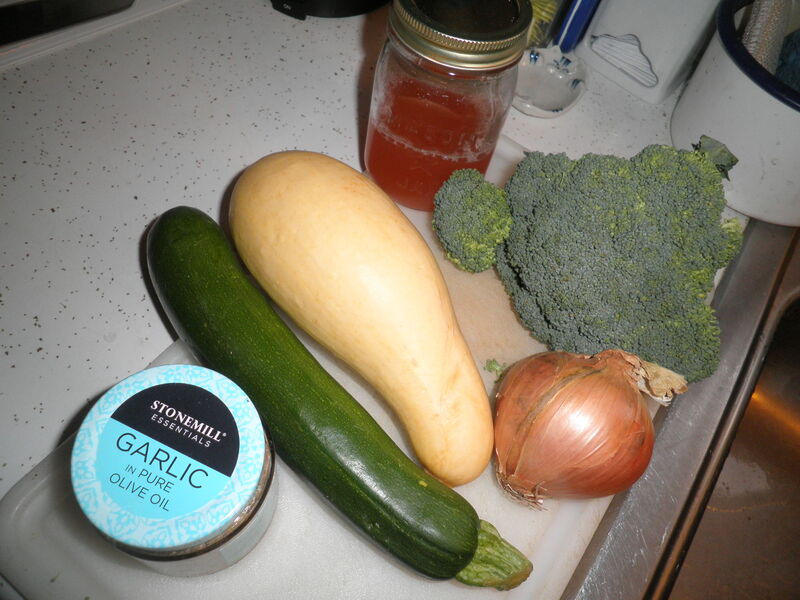 Zucchini, yellow squash, garlic, onion, broccoli and veggie broth. 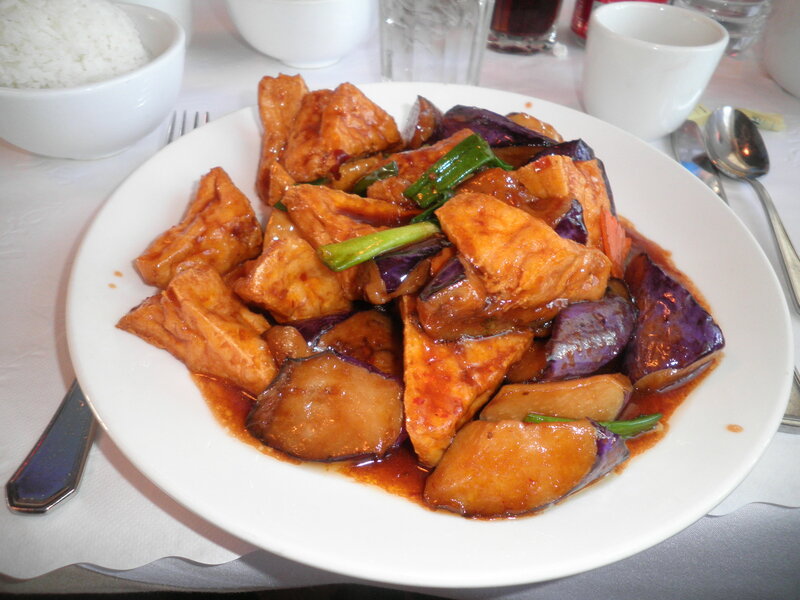 I accidentally left out the World’s Biggest Potato which would be the base of this dish. 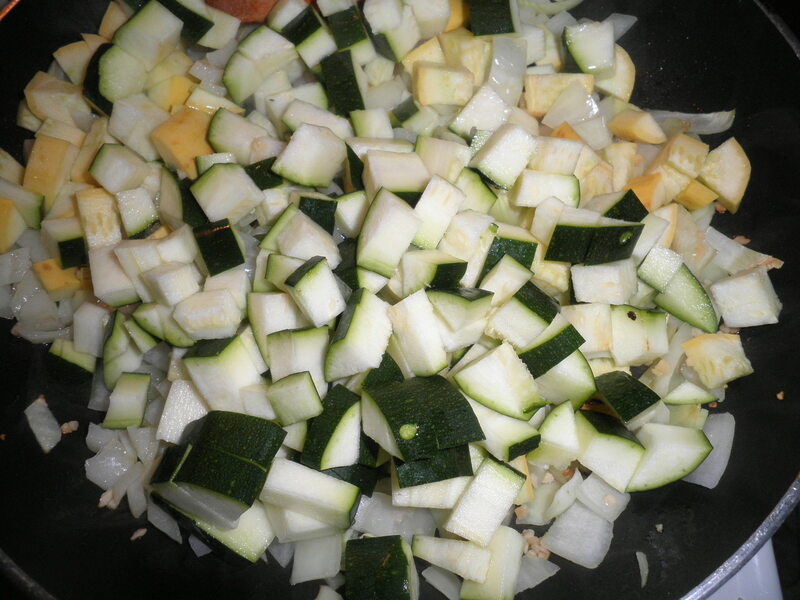 All chopped up and cooking away! 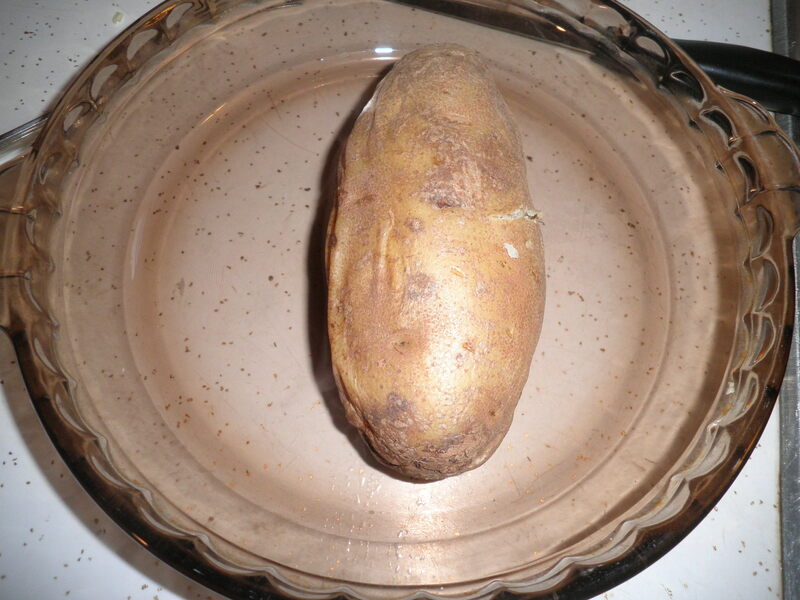 The previously mentioned World’s Biggest Potato! 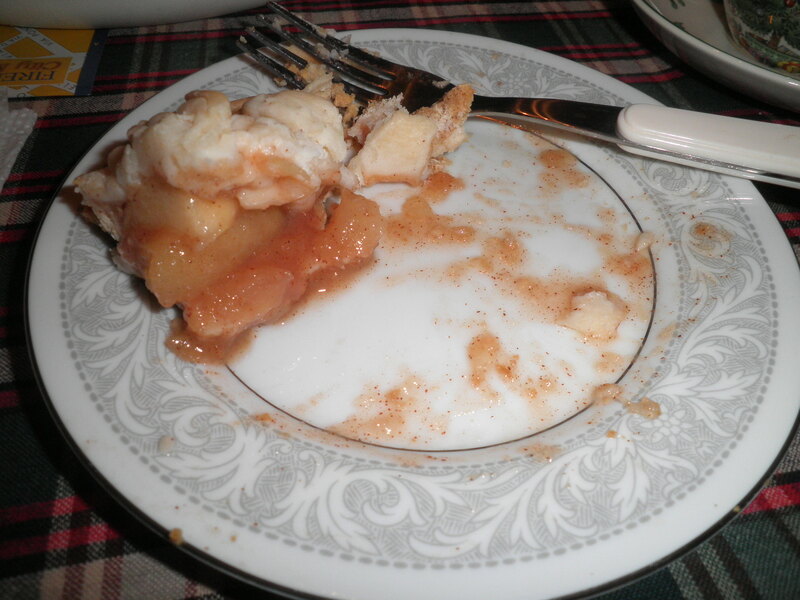 I microwaved it and of course I cut it up, but forgot to take a photo…Doh! 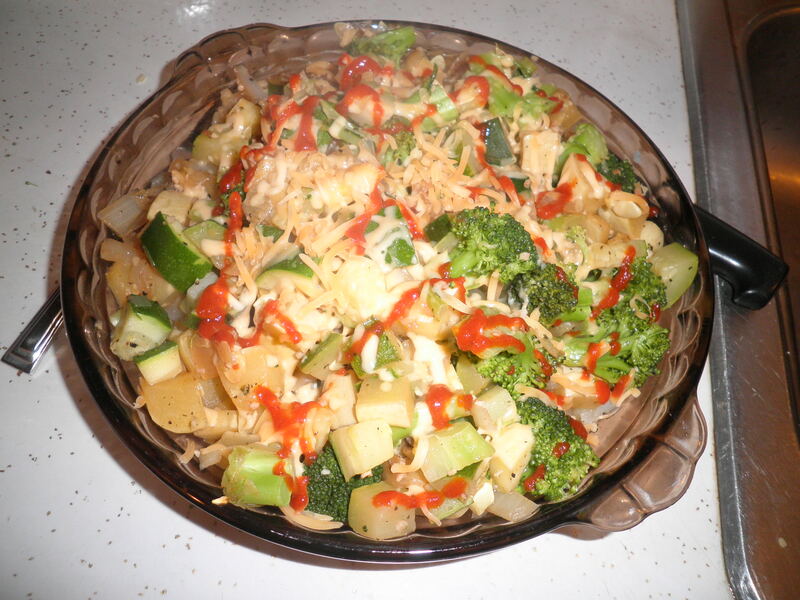 All cooked up and all dressed up with shredded 2% cheese and the ever-present sriracha sauce. 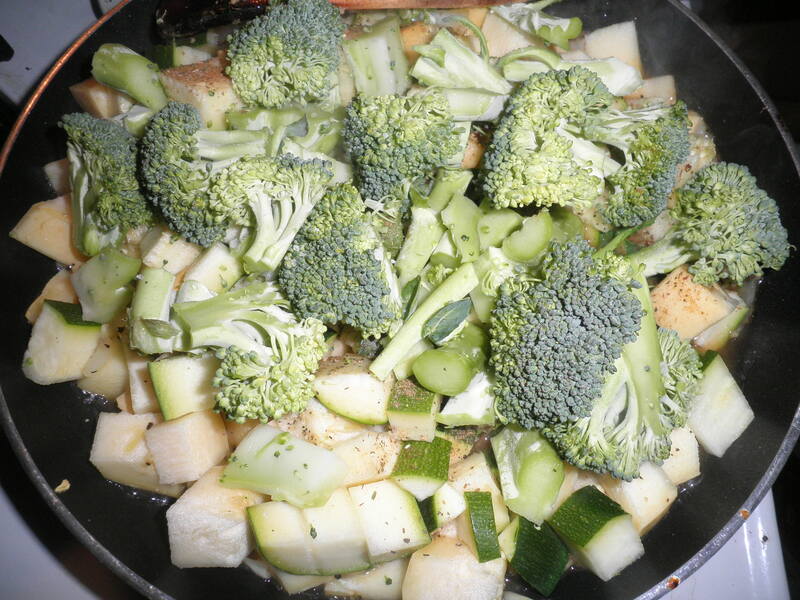 Due to the size of the potato and the amount of veggies I used, when I was finished and ready to burst, I made Ralph laugh by saying, “I don’t think I have to eat again for the rest of my life!” I was so full, but it was so tasty…I Had to finish it! So that What I Ate Wednesday for this week. Be sure to go over to Peas & Crayons to read all of the other bloggers and leave some comments…We all love comments! 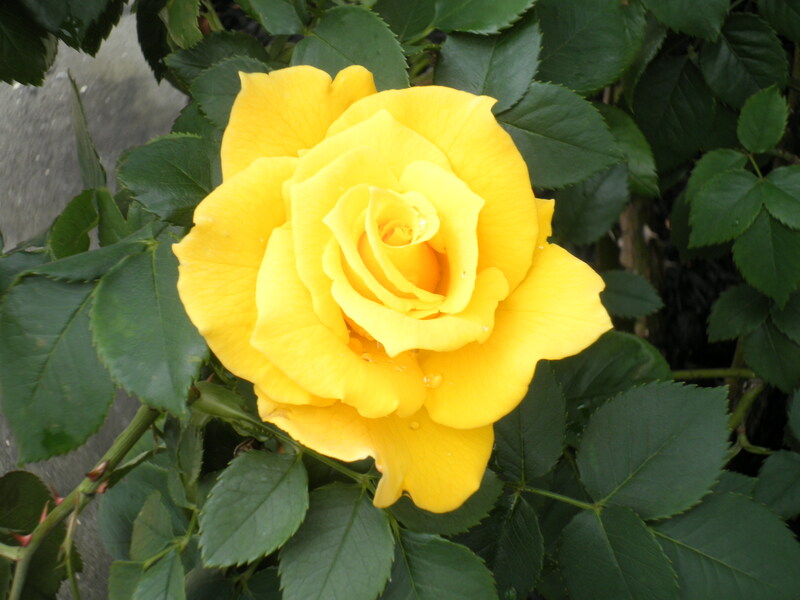 Or so it seems by looking at my photos today! First I have to mention the fact that I had quite a few comments yesterday encouraging me to try a green smoothie. Ok, You’ve got me. This weekend I’m going to experiment with one and I’ll let you all know next week if we (Me and my Magic Bullet) survive! 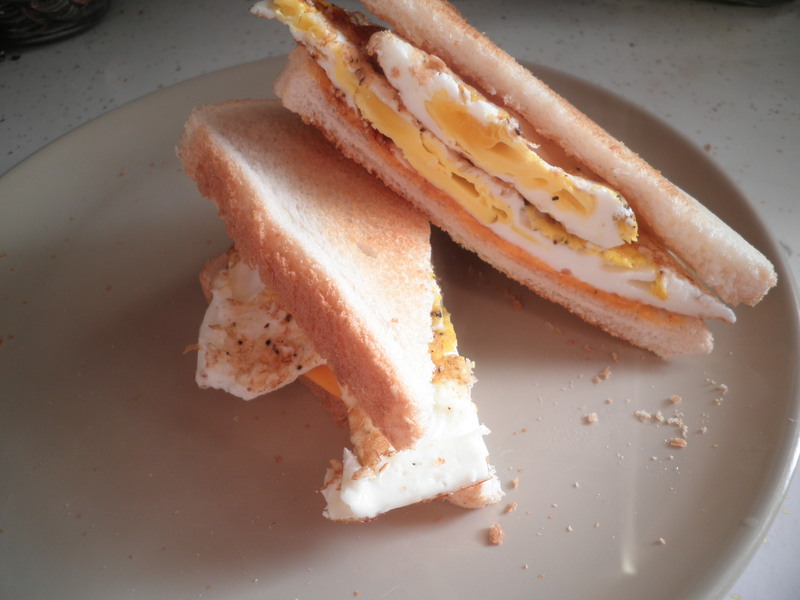 Wednesday morning I started out by making egg salad. Ralph was a little disappointed last week when I made chicken salad for him and kept the egg salad to myself. So it’s for both of us this week. Gotta keep him happy! 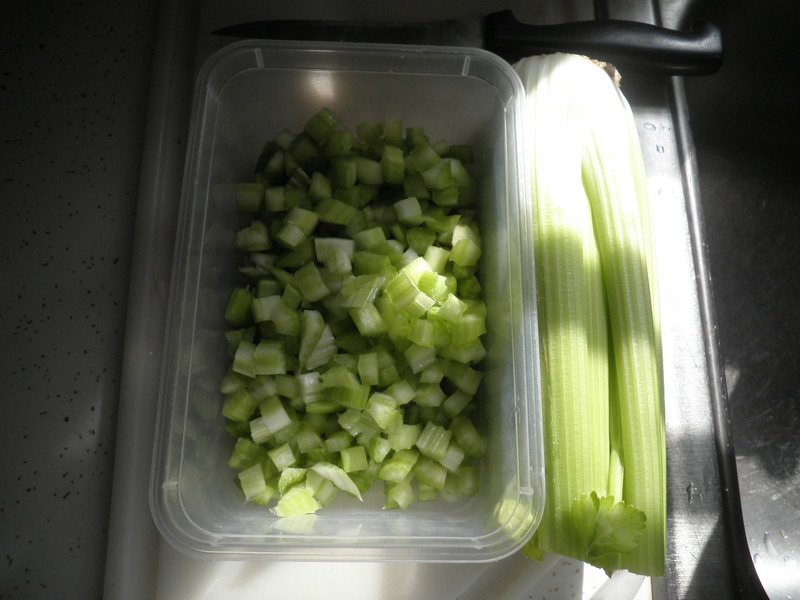 Lots of celery chopped up. 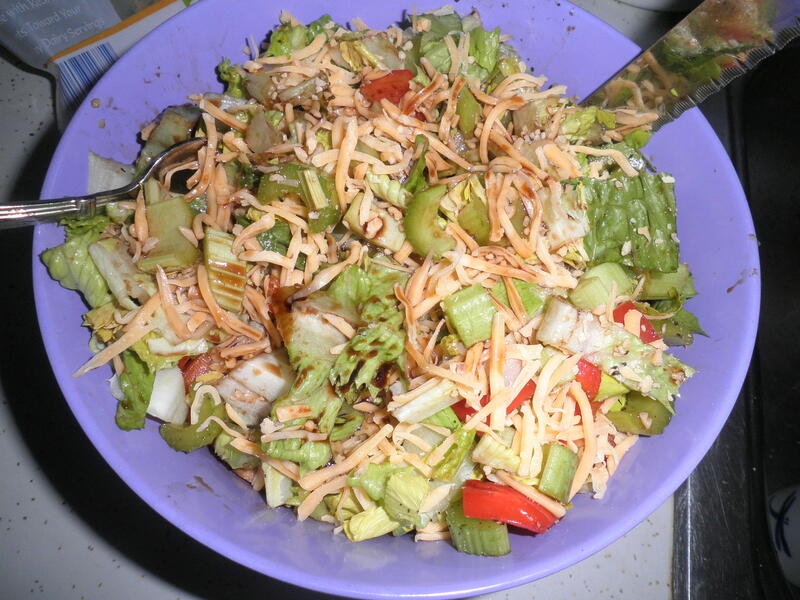 It’s actually Ralph’s idea, he loves it in egg salad, chicken salad, etc. It’s a great idea. 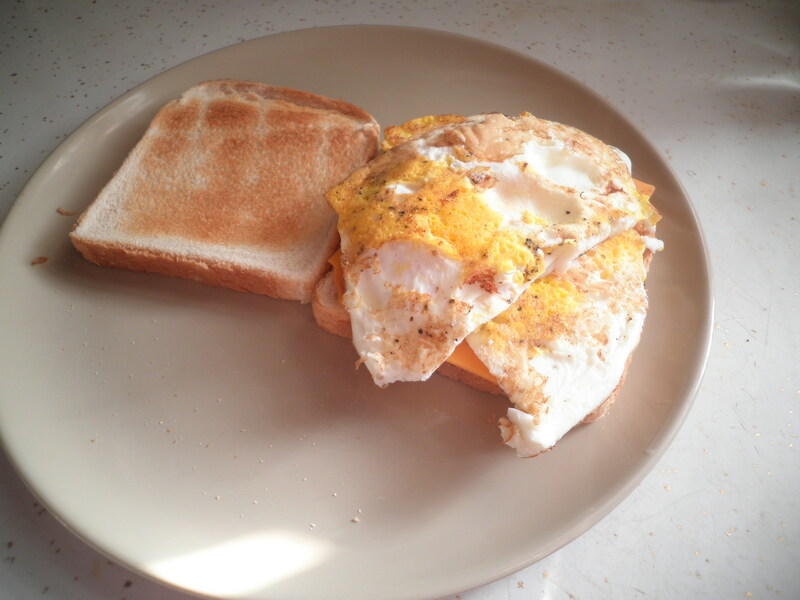 It makes the eggs go farther, adds crunch so you eat it more slowly, tastes good and is good for you. Why not add it. 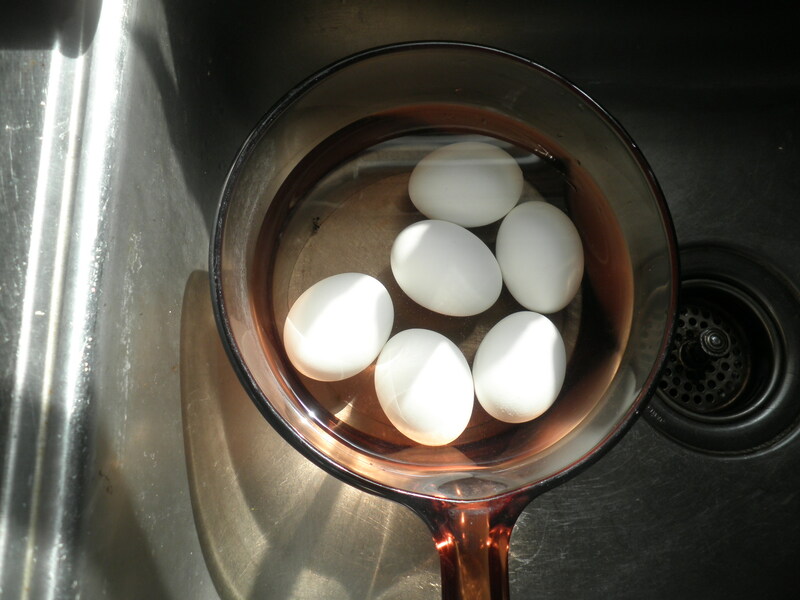 Eggies cooling in the sink post boil. 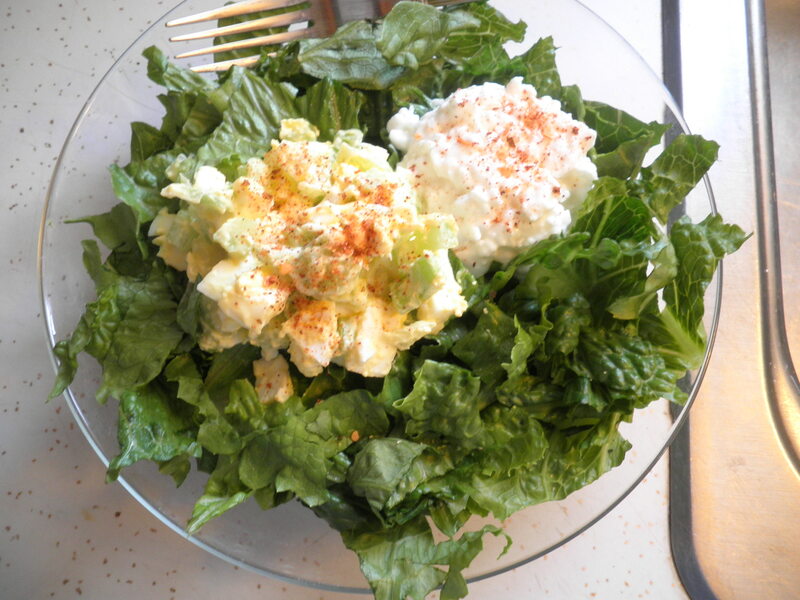 Yummy lunch… 1/4 cup of low-fat cottage cheese, 1/4 cup of egg salad on Romaine topped with Mrs. Dash’s Fiesta Lime, one of my favorites. 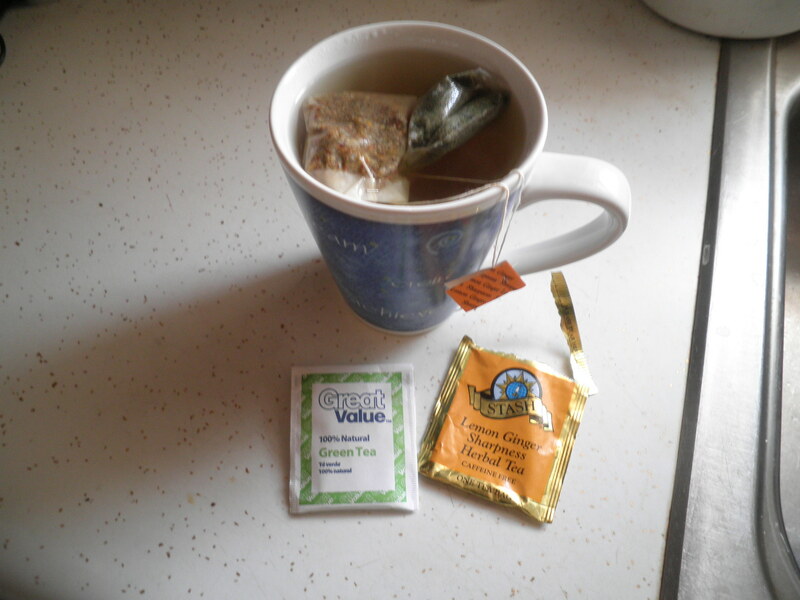 Everyone was talking about green tea yesterday on WIAW and I decided to have some for my afternoon tea. I have several varieties and since it’s supposed to be good for me, why not. I already have it so it didn’t cost me anything! This was Lipton’s pomegranate green tea. Very tasty. Please take note of my lovely dragonfly cup that my sister, Ele gave me, quite a few years ago now. It’s one of my favorites! Dinner was another of my combos. 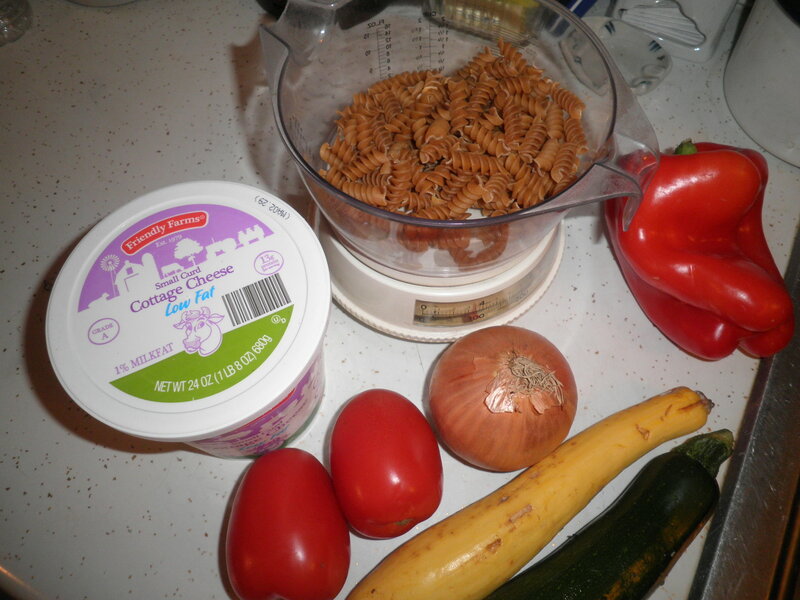 Whole wheat pasta, zucchini, yellow squash, onion, garlic, plum tomato, red bell pepper and low-fat cottage cheese. All the steamy goodness! I love using the cottage cheese in something like this. I add 1/2 a cup and I get 14 grams of protein for only 2 Points on Weight Watchers. It makes it all cheesy and gooey as if I used a higher Point cheese. One of my faves! We have a few things on the agenda today so we’ll be out and around. No telling where we’ll end up but I think lunch will be involved! We’ll see where we land! Isn’t it frustrating when you have the best intentions in the world to get together with friends and it doesn’t seem to happen? That happens to Ralph and me so often but sometimes it does help to have persistent friends. 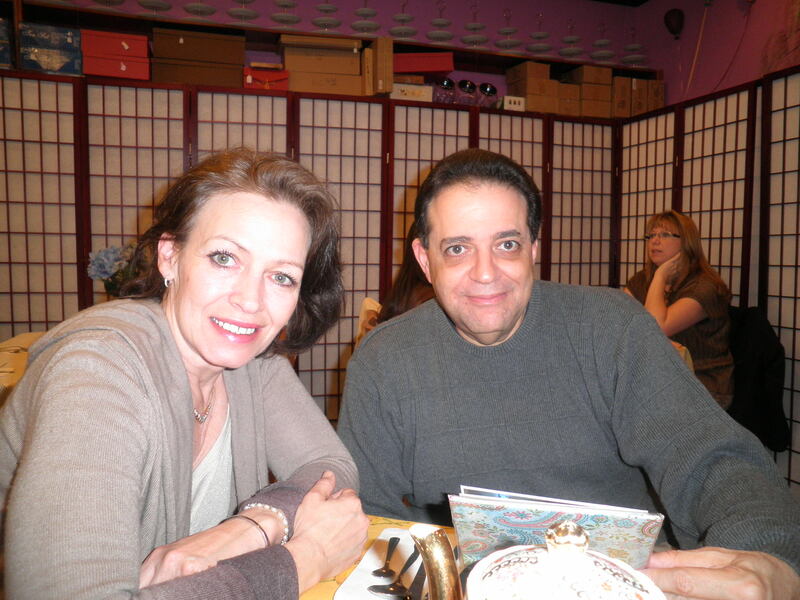 Our friends Ed and Tina keep saying we should get together, but Ed is a take charge kind of guy. He called Ralph and they set a date. 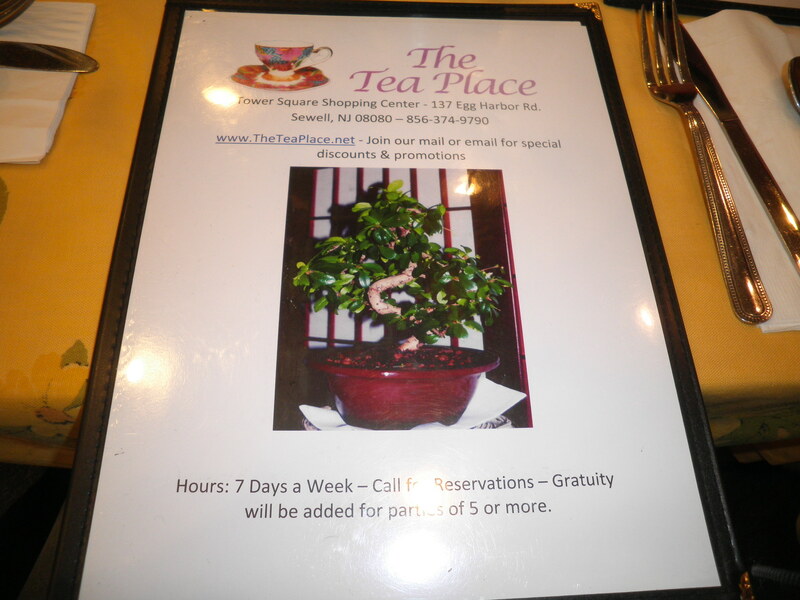 The Tea Place in Sewell, NJ. I’ve been here before and it is so unique and so much fun. 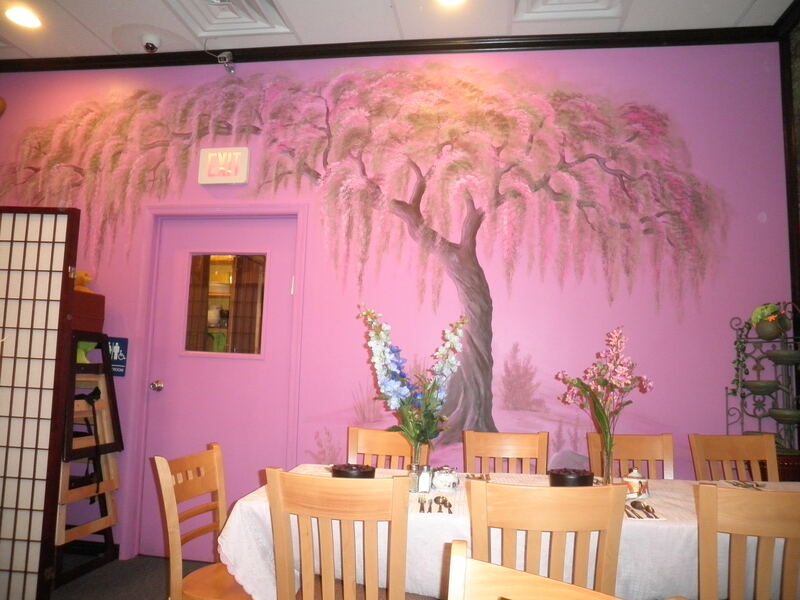 Beautiful hand painted art work. 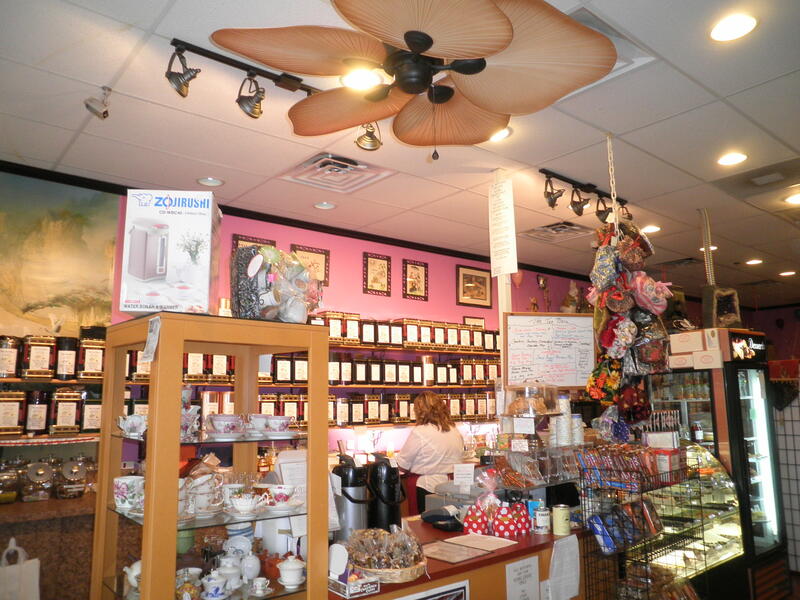 We had Chelsea Tea and White Tea, both delicious. 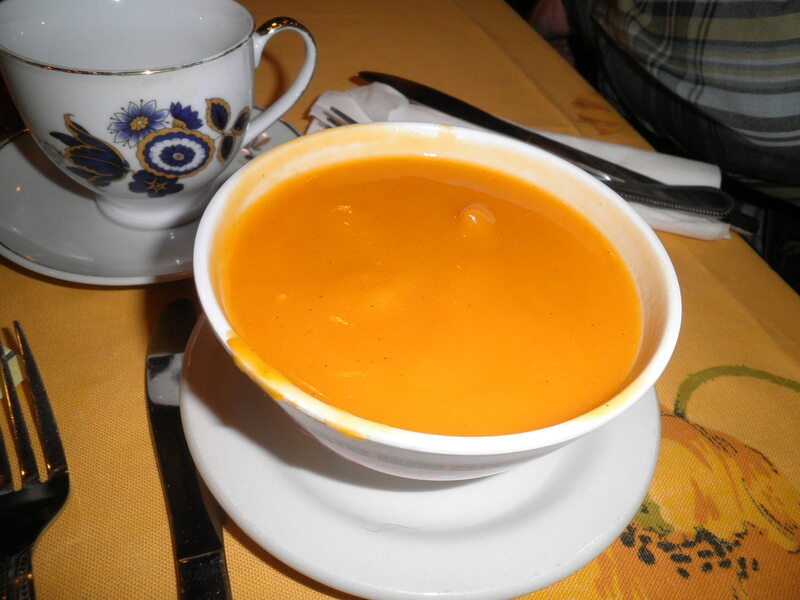 We all started with the butternut squash soup. 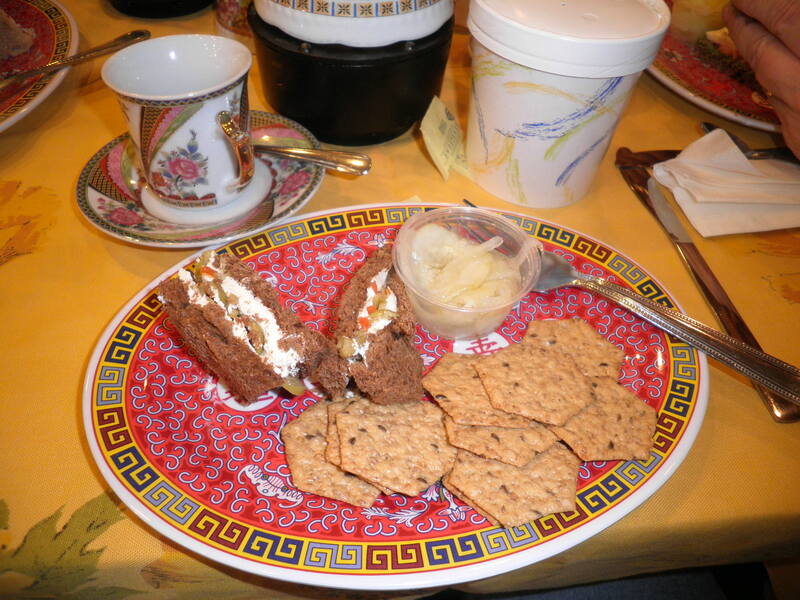 I then had the Queen Spanish olive with pimento in cream cheese on pumpernickel. We sat and sat and talked and talked. 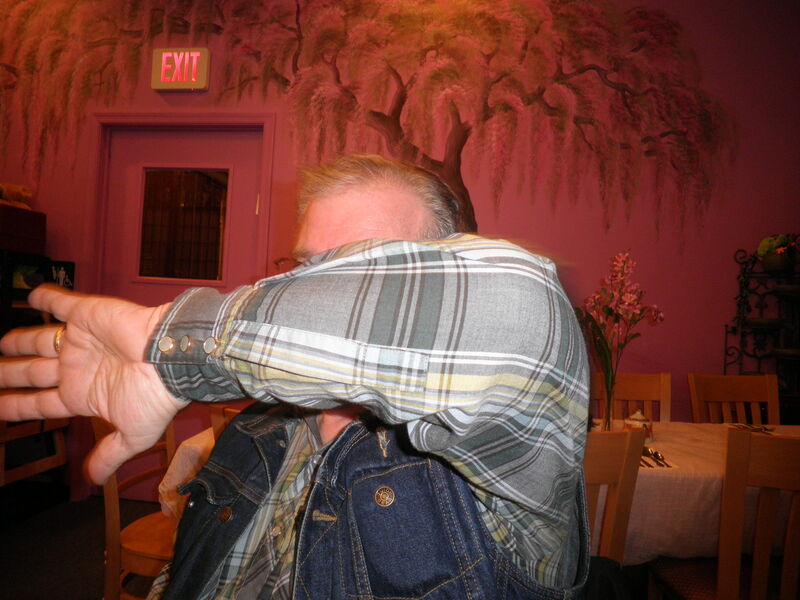 Ralph making an editorial comment about being photographed for BCDC!! 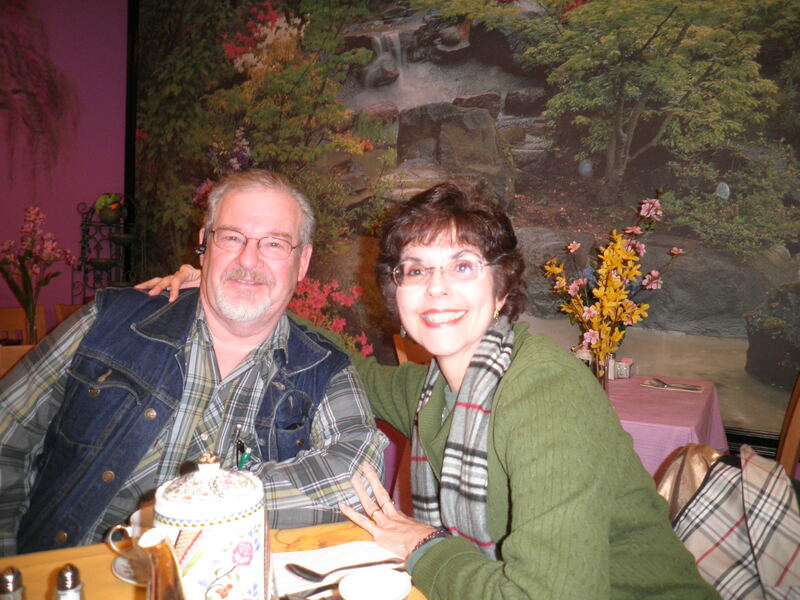 We had a lovely, long visit and extra pots of tea. It was so much fun. 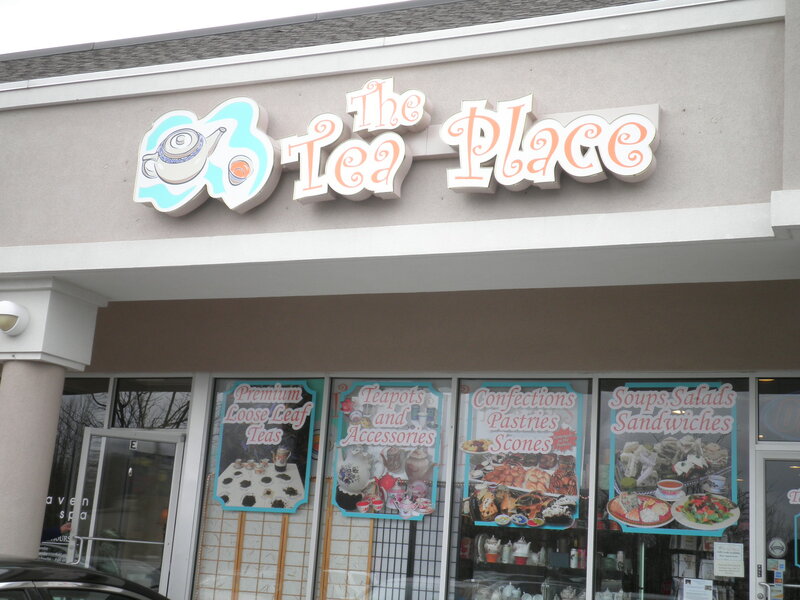 Ed and Tina go to The Tea Place regularly so we’re going to try to get together again sooner rather than later. There’s also a cigar club in the same shopping center and the guys will probably get together there at some point which means that Tina and I can get together and do girl things! My meditation practice went well in the morning and I feel more connected to it every day. Since it was Ash Wednesday, I’ve decided what I’m giving up for Lent. 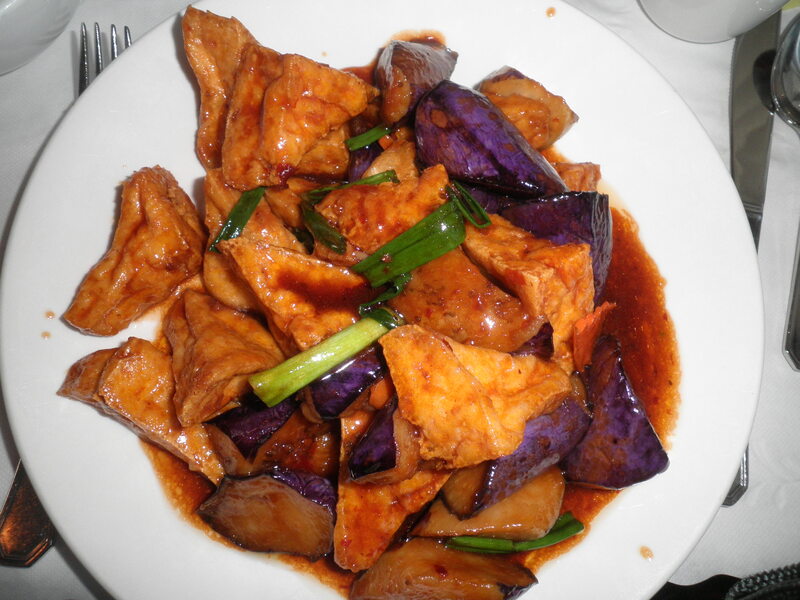 Drumroll please…Chips! Ok, can I do it? Ralph told me this morning he’s never stuck to giving up something for Lent. He doesn’t think I can stick to it. Sounds like a challenge to me! Day one! 🙂 Happy Thursday!